While mountain gorillas are the main attraction for visitors to the verdant forests of Uganda and Rwanda, there are many other primate species to view in these Central African wildlife reserves. After seeing the gorillas in Bwindi Impenetrable Forest and the Parc National des Volcans, the endangered golden monkey offers a different tracking experience. Meanwhile Kibale Forest in Uganda and Nungwe Forest in Rwanda contain some of the highest concentrations of primates in the world, with an estimated 13 species resident in each location. Chimpanzees are the main draw here and groups can be tracked on walking safaris through these forests. Other primates found here include various species of colobus monkey, L'Hoest's monkey and the owl-faced monkey. An alternative experience is available on Ngamba Island on Lake Victoria which is home to a chimpanzee sanctuary for orphaned chimps have been rescued from poachers. Bwindi Impenetrable National Park in south-western Uganda comprises 330 km² of primeval forest in altitudes ranging from 1200 to 2800 metres. 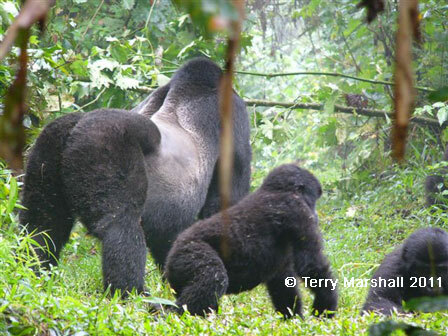 It's an area of remarkable biodiversity of plant life, birds and butterflies but the main draw is the mountain gorilla, of which there are approximately 300 in the park. This is one of only two locations in the world where you can track a habituated family group of mountain gorillas, probably the most exhilarating wildlife experience you can imagine, though it can take an arduous trek through the forest to find the gorillas. 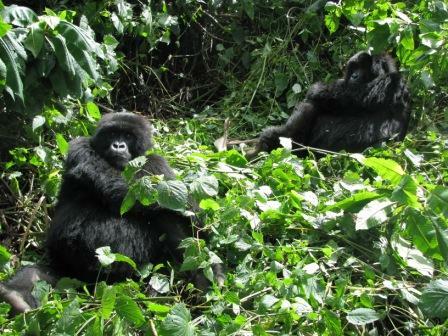 Bwindi is also home to other rare primates such as L'Hoest's monkey and the golden monkey. Kibale Forest National Park is an equatorial rainforest that has one of the highest concentration of primates in the world. The park contains 13 different species of primates, with the main draw being the 500 or so chimpanzees that live here which can be viewed on walking safaris. Other primates in Kibale include the black and white colobus monkey, red colobus, L'Hoest's monkey and the grey-cheeked mangabey. In addition the park has a huge diversity of butterflies and birds, including crowned eagles, yellow-mantled weavers, African grey parrot and the black bee-eater. Ngamba Island on Lake Victoria is 23km south of Entebbe and home to a chimpanzee conservation effort. Orphaned chimpanzees have been relocated here by conservationists and a fenced off visitors area allows viewing of these animals. The Volcanoes National Park is a forested area in the Virunga Mountains that border Rwanda, Uganda and the Democratic Republic of the Congo. This is Rwanda's premier tourist attraction, with the mist-covered volcanoes of the Virungas being one of only two locations in the world where you can track a habituated family group of mountain gorillas (the other is Bwindi National Park in Uganda). It was here that Dian Fossey lived and died studying and protecting the gorillas, her efforts made famous in the film 'Gorillas in the Mist'. The opportunity to trek to a gorilla family and spend an hour in close proximity observing these remarkable creatures is one of the most thrilling wildlife experiences on Earth. Currently seven of the park's gorilla groups are habituated to tourists with eight permits available for each group every day. The park is also home to 75 other mammal species including elephant, buffalo and the endangered endemic Golden Monkey, a troop of which has also been habituated and can be tracked in the bamboo forests on the lower volcano slopes. 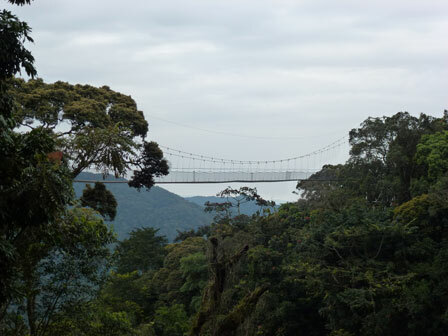 Nyungwe Forest covers some 1000 km� in the southwest of Rwanda and is an area of huge biodiversity. Primates are the main attraction here, with some 13 species identified, including some habituated groups of chimpanzees and colobus monkeys that can be viewed on guided treks through the park. Other primates include L'Hoest's monkey, owl-faced monkey, silver monkey and red-tailed monkey. It is also an excellent place for bird watching with some 270 species found here. There are many walking trails throughout Nyungwe Forest which can be explored on guided tours. Several of these depart from the Uwinka reception centre which include the chance to walk along the new 200 metre canopy walkway which offers spectacular views of the forest. The longest trek in Nyungwe is the Congo-Nile Divide Trail, a 3-4 day trek along a ridge that forms the continental divide between the Congo and Nile watersheds. Organised group tours: Click here to see 3 tours to Lake Victoria (Kenya/Uganda/Rwanda) which may include Primates of Central Africa.